Tumblestone is a casual puzzle and competitive multiplayer game that completely reinvents the Match-3 genre into a deep and cerebral puzzle solving experience that you won't forget. 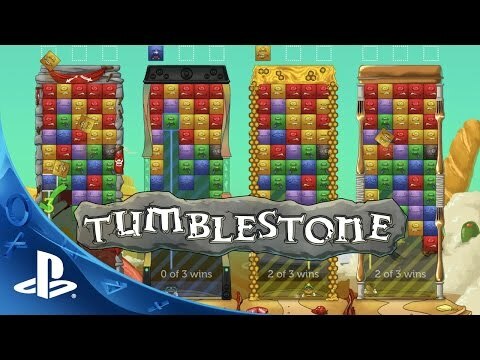 Tumblestone is a casual puzzle and competitive multiplayer game from the creators of The Bridge. Tumblestone's beautiful, hand-drawn artwork will captivate you while the maddeningly addictive gameplay will keep you playing "just one more round" with your friends. At first glance Tumblestone may resemble other Match-3 games, but it completely reinvents the genre into a deep and cerebral puzzle solving experience that you won't forget. Cross-Buy: Purchasing this game entitles you to the PS4™, PS3™, and PS Vita versions for one price. Local multiplayer: Up to four players on a single PS4™. Story mode: The 30+ hour story campaign will test your puzzle-solving prowess. Featuring 10+ gameplay modifiers, challenge puzzles, and boss battles. Challenges: Hundreds of unique challenges to complete. © 2015 The Quantum Astrophysicists Guild, Incorporated. All rights reserved. Not responsible for broken controllers or friendships.